The International Research Center for Nuclear Materials Science (the “IRC”, known also as the Oarai Center and formerly the Materials Testing Reactor Facility) of the Tohoku University Institute for Materials Research is a facility for collaborative usage by universities throughout Japan. For more than 40 years since its founding, it has served researchers from universities in Japan and other bodies as a site for testing radioactive samples and actinides essential for research on materials necessary for nuclear energy, and has forged a leading position in these fields. The IRC has been able to achieve this with the Japan Materials Testing Reactor (JMTR) and various other facilities and technologies provided by the Japan Atomic Energy Agency and through the cooperation of researchers from universities and other bodies who have performed collaborative usage research, and many others. Research has been performed at the Oarai Center in a wide range, including elucidation of the mechanism of deterioration in the structural materials of electric generating nuclear reactors under irradiation, basic research and development of new materials for future energy sources such as fast reactors and fusion reactors, exploration for new actinide (5f electron) substances and properties, development of new types of nuclear fuel, and analysis of radioactivation, all resulting in many advances. The accident at the Fukushima No. 1 nuclear power plant in the East Japan Earthquake of March 2011 brought a marked change in the environment for research on nuclear energy materials, and a rising demand by society for research on ensuring safety and security and on nuclear decommissioning, and a growing awareness of the importance of human resources development as essential to the future of nuclear energy. Research was complicated, however, by the suspension of all nuclear operation in Japan (as of April 2015). Reactors located overseas have since then been used as sites of neutron irradiation in place of domestic reactors for research on nuclear energy materials, which forms the basis for research on nuclear energy. The same period was also marked by an approaching generational change in academia from teachers who had taken part in the dawn of nuclear energy in Japan and with the rising need for increased human and financial resources to meet the responsibility for collaborative usage research facilities that can handle radioactive isotopes and nuclear fuel, and for safe operations management. 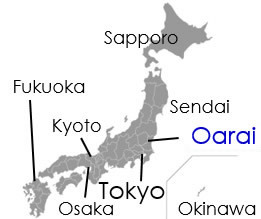 While responding effectively to this change, the Oarai Center has widened its field of vision from nuclear energy materials research in a narrow sense to new wider range of research as a center characterized by utilization of equipment that makes it one of the world’s foremost hot labs together with world-leading analysis and property measurement capabilities, working to contribute to the research community. In this we hope for your continuing encouragement and good will.